For Fusion to be able to keep itself inside the rink, we need to be able to teach Fusion how to detect the difference between the white middle of the rink, and the dark edge of the rink. We can do this by using Fusion’s Optical Distance sensor. We need to detach the black sensor from the top of Fusion, and move it to the mounting holes circled below. 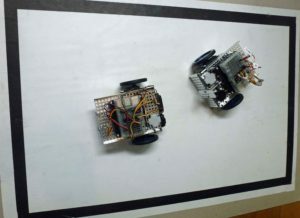 Fusion Robot mounting holes used for Optical Distance Sensor SUMO and Line Edge Following. 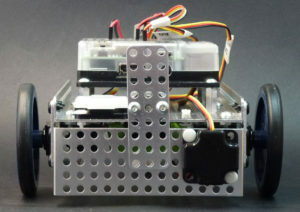 The moved sensor will look like this. 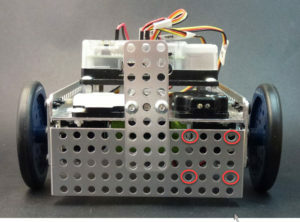 Fusion Robot Optical Distance Sensor mounted for SUMO and Line Edge Following. The Optical Distance Sensor can shine a light on the arena, and can measure the amount of light that is reflected from the arena. A black surface reflects less light, and a white surface reflects more light, as demonstrated in the video below.